Machina is a menswear clothing brand that is in the process of mounting a Kickstarter campaign to promote a new product. The campaign doesn’t start for about a month, but the company has a demo version of its unique “wearable” MIDI controller live on the floor of TechCrunch Disrupt in San Francisco this week. The Machina MIDI Jacket will come in a couple of different styles, but the basic concept is that it is a jacket or vest that is outfitted with several different sensors (multiple MIDI touch sensors, accelerometer, etc.) that can control beats and samples via Wi-Fi and MIDI. So you can effectively trigger and alter tones by moving your fingers accross the three sliders on the front of the vest. 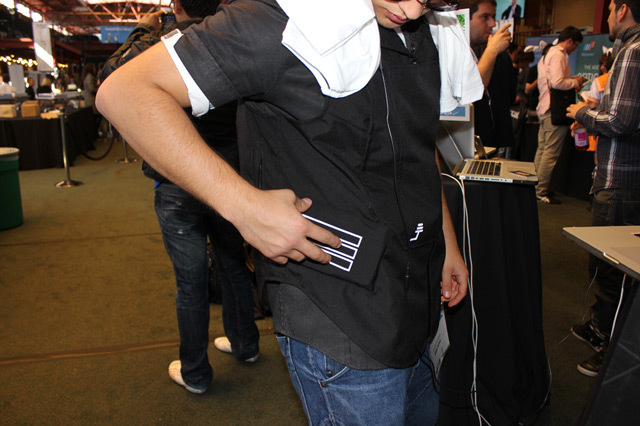 You can also affect the speed of a beat or sample by moving your arm and the accelerometer in the sleeve. This is a cool concept and an interesting and kinetic way to trigger and control beats and sounds. It works with a custom Mac OS X application that the company also created, with iOS versions soon to follow (for maximum portability). I got a hold of their Kickstarter video a bit early, and they gave me permission to post it. They will have more info about this new concept at their website in the coming weeks.